The cotton-candy pink of Villa MA AZU set against the cerulean sky and sparkling Caribbean water make it seem as if the home is an illustration torn from the pages of a storybook. 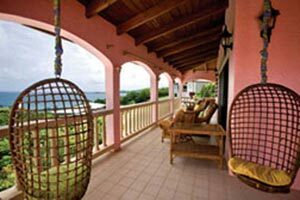 Situated on St. Thomas’ east end, set away from the hustle of downtown, this picturesque Virgin Island villa is the perfect destination for lounging on the beach and spending time with loved ones. Bring the family to Villa MA AZU for an unforgettable Caribbean vacation. With both Secret Harbour Beach and Vessup Beach less than five minutes away, Villa MA AZU is the idyllic destination for those who just want to relax and enjoy quality family time. The villa comes complete with snorkel gear, so you and your family can explore St. Thomas’ fascinating sea life. The home also comes equipped with a variety of games and over 100 DVDs, perfect for a family night after a day of splashing in the swimming pool or building sandcastles on the white sand beaches. For those traveling with tots, Villa MA AZU offers guests a Pack-N-Play, playpen, and baby monitor. Casual and comfortable, Villa MA AZU invites you to just relax and enjoy your time spent together. Find out more about St. Thomas’ MA AZU and make your Caribbean vacation dreams come true at WIMCO.